The Nvidia Shield has a beautiful display, blistering performance, a light, comfortable and good-looking design and a clean interface, making it the best 8-inch Android tablet. 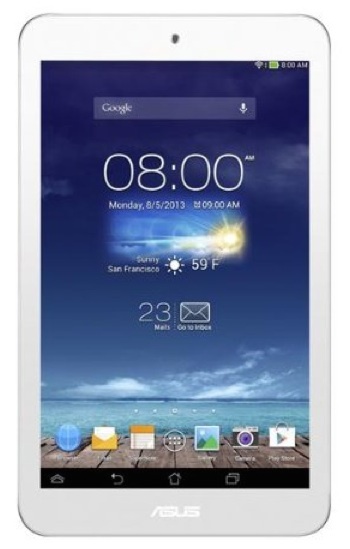 Shopping for a smaller tablet can be daunting, thanks to the sea of 7- to 8-inch Android devices available. It would be simple if most of the low-cost models were easily dismissed, but Android tablets are getting lighter, slimmer, faster and more powerful while simultaneously getting less expensive. To find the very best tablets, I looked for four key elements: a bright, vivid, pixel-dense display that looks great at any angle; a lightweight design that's comfortable to hold in one hand for long stretches; a powerful CPU coupled with a good amount of RAM for smooth, speedy multitasking; and an interface that's easy to understand and navigate even if you're not tech-savvy. Price was also a consideration — a great small tablet shouldn't break the bank. That narrowed the field down to three standout tablets: the Asus Memo Pad 8 ($129 on Amazon), the Samsung Galaxy Tab S 8.4 ($389 on Amazon) and the Nvidia SHIELD Tablet ($299 on Amazon). In the end, the Shield Tablet is my ultimate pick for best small tablet based on its balance of price point and feature set. 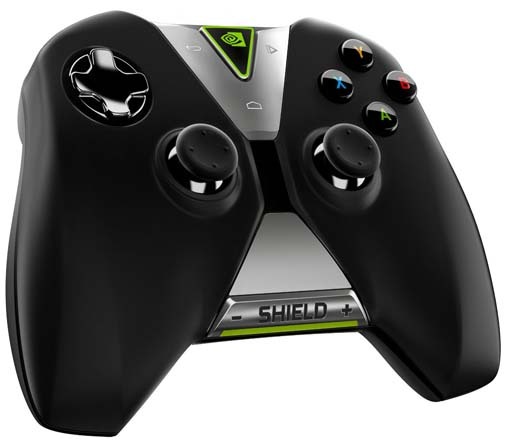 Nvidia designed the Shield Tablet primarily for gamers, so its long list of impressive features includes things like superfast gaming performance and the ability to wirelessly stream PC games from the computer to the tablet. The same elements that make this a great gaming tablet make it a great all-around tablet as well. The Tegra K1 processor inside isn’t just quad-core; like most tablets, it has 192 graphics cores. That translates into a smooth experience no matter what app or game you're running, and it ensures the tablet will be able to keep up with Android apps well into the future as they grow more complex and resource-hungry. The Shield Tablet’s 8-inch, 1920 x 1200 resolution creates deep colors and crisp details that don't wash out or distort when you hold the tablet at an angle. Whether you use the Shield to read an e-book or a Web page, its high pixel density means that small fonts stay sharp. The Shield’s display doesn't pop as much as the display on the Galaxy Tab S 8.4 (2560 x 1600 Super AMOLED), and if you look closely, the difference in resolution is noticeable. If you want the very best display, the Tab S has it. But side by side, the Shield Tablet stands up quite well to this competition — especially impressive since it costs about $100 less. Another notable difference between the two tablets is weight. The Tab S 8.4 is incredibly thin and light for its size, weighing 10.4 ounces versus the Shield’s 13.7 ounces. The Shield is still light enough to hold with one hand during long reading sessions or with two for longer gaming sessions without making your wrists ache. 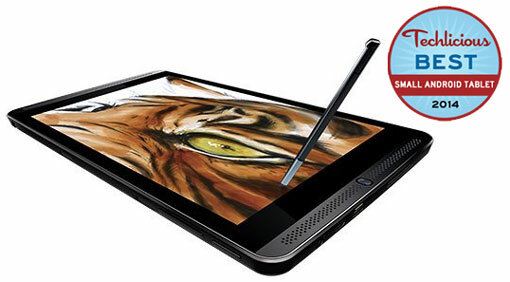 On top of its sweet gaming features, the Shield Tablet offers one more extra that makes it enticing: a stylus. Just like the stylus for Nvidia's last tablet, the Tegra Note 2, the Shield's stylus is a step above the kind of capacitive styluses that work on any tablet, but it’s not the same technology used in active digitizer pens like those with the Galaxy Note series. Active pens are more desirable because they're accurate and precise, making it easy to reject input from a palm or finger. They achieve this through wireless communication between the pen and the display, which makes the tablets more expensive. Coupled with the processing power of the Tegra K1, the Nvidia DirectStylus 2 software emulates this functionality in the Shield's pen, even though it's not an active digitizer. You still get a very thin, precise tip, and there's even some pressure sensitivity and (even more impressive) palm rejection — all without expensive hardware. Nvidia has included a handful of note-taking and writing apps that take advantage of the pen, including Evernote, Write and a handwriting recognition keyboard. The company also developed a neat drawing app called Dabbler that emulates several different types of drawing and painting environments, including wet watercolors. Outside of last year's Galaxy Note 8, this is the best stylus experience available in the 8-inch tablet range. Most popular Android tablets come with an interface skin over the base operating system that changes the look and some of the functionality of the OS. Google Nexus tablets and, now, the Shield tablet are major exceptions to this rule. Although Nvidia did a ton of work on the back end to give the tablet some gaming chops, the company didn't mess much with how Android 4.4 KitKat operates, preserving the stock look and feel. I've praised well-designed skins on tablets from Samsung, ASUS and other companies in previous reviews, and in truth, I prefer them since they smooth over some of Android's rough edges and make executing some actions more efficient. However, KitKat is Google's most polished version of Android to date, and if you prefer to take customization into your own hands, the Shield Tablet offers the same blank canvas that Nexus devices do. You’ll find a few Shield-specific tweaks, such as the Shield Hub interface/menu for easy navigation while connected to a TV and using the game controller. (More on this later.) There's also Console Mode for streaming full HD video or games to an HDTV. Otherwise, it's Android business as usual. The same hardware that makes the Shield Tablet a gaming beast also makes it a great little machine for watching video, showing off pictures and listening to music. Between the beautiful display and the high-end graphics, you'll enjoy smooth playback of full HD and 4K movies from the device or via streaming. The latter is possible thanks to a dual-band, 2x2 MIMO wireless antenna that connects to the strongest signal available to receive and send data at super-fast speeds. The Shield sports a pair of speakers on the front, flanking the display. It’s no surprise, then, that the Shield’s audio quality is well above average — and not just because the sound blasts directly toward you. The sound quality is the best I've heard on a tablet, well rounded in the mid-range with actual bass. It bests the Galaxy Tab S 8.4’s sound without trying (although it doesn't take much to earn that distinction, since most tablet speakers aren't great). Still, it's still a nice touch that means that you won't need headphones to get a good audio experience. Aside from Shield-optimized games in the Shield Hub, you won’t get any special or exclusive content sources beyond what you can find in the Google Play store. The Shield is singular in that it has 5-megapixel cameras on the back and the front. Both take above-average pictures for tablet cameras and are supported by a robust camera app that makes it possible to tweak settings for better images. The high-quality front camera is a bonus not only for people who love selfies but anyone who likes to video chat. As I said at the start, you don't need to be a gamer to appreciate all the great things about the Shield Tablet. But since it is designed for gamers, you’ll appreciate several features and accessories that only add to this device's value. First and foremost is the optional game controller ($60 at Amazon), designed to be just as comfortable and robust as an Xbox or PS4 controller. It communicates with the tablet wirelessly over Wi-Fi, not Bluetooth, managing lag so minuscule you'll never notice it when playing. All of the games available via Nvidia's Hub work with the controller out of the virtual box; for others, mapping app lets you use it with almost any game. The most impressive software feature is GameStream, a technology that makes it possible to play the high-end games stored on your PC using the tablet. Currently, GameStream only works when the computer and tablet are on the same wireless network — so just in the home — and with specific hardware on the PC side (not to mention some suggested routers). That said, being able to play a game meant for a computer on a tablet is really cool. And when you’re in console mode and connected via HDMI, you can play those same games on a big-screen HDTV without having to move the computer away from your desk. Gamers love sharing game play with friends (bragging rights are important), so Nvidia has built in a sharing option that allows you to record game play for sharing or streaming to gaming video site Twitch. The only drawback for gamers is that the $299 model only includes 16GB of internal storage. There's a microSD card slot to hold media and some app data; however, this version of Android severely restricts moving and running apps from SD cards. Games tend to take up more space than other apps, so you’ll need to keep a close eye on available space. A 32GB model is available, although it comes with an additional element: LTE. The extra storage and antenna make for a $100 price bump. At release, the Shield Tablet impressed pretty much every reviewer who got their hands on one. CNET sums it up nicely: "Even if you don't take advantage of its gaming prowess, the Nvidia Shield Tablet is one of the most versatile — and affordable — high-performance 8-inch Android slates you can buy." The Shield Tablet has all the elements of a great tablet: a beautiful display, blistering performance, a light, comfortable and good-looking design and a clean interface. It adds some sweet gaming features and a surprisingly excellent stylus on top of that, all for the relatively low price of $299. Even if you don't care about gaming, this tablet’s closest competition is the Samsung Galaxy Tab S 8.4, which costs almost $100 more. While the Galaxy Tab does have a lighter design and a brilliant display, the Shield is more than competitive on both fronts. That's why it's my top pick. The $129 ASUS Memo Pad 8 is the tablet you want if you’re looking for something under $200. It used to be that tablets in this price range were either very limited in functionality or poorly built. That's no longer true, and the Memo Pad line in particular has exemplified how low cost can be done right. The 8-inch IPS display has a relatively low resolution of 1280 x 800 pixels, but the quality of the screen itself is quite good. No matter what angle you hold it at, the vivid colors stay true and don't wash out or distort. The screen gets pretty bright too, although it's a bit reflective even at 100 percent brightness. The Memo Pad is lightweight yet feels well-built and sturdy, not cheap. It runs on a quad-core Intel Atom processor, a decently powerful and speedy CPU for an Android 4.4 device, able to handle any basic app with ease. However, the Memo Pad’s relatively small amount of RAM (1GB) means that resource-hungry apps may choke. If your needs are simple — email, browsing, a few casual games — then you won't have problems. Asus has created a custom UI skin to go over Android called ZenUI. While it does add some functionality and change up the operating systems menus a bit, this skin is mostly a light touch. The closest competition in this price range is the Amazon Fire 6 ($99 on Amazon) and Fire 7 ($139 on Amazon) as well as the ASUS Memo Pad 7 ($125 on Amazon), the 7-inch version. The Fire 6 is the most tempting of the bunch due to its $99 price. However, Amazon's newest tablets continue to suffer the same challenge as always: a limited Android experience. With the Fire, you can only run apps from Amazon's store. The company has a vast library, but it’s not as deep as Google Play. The 7-inch Memo Pad is almost identical to the larger version both inside and out, and it’s the next generation of the very impressive Memo Pad HD 7 from last year. Unfortunately, this year's model doesn't have as nice a display or as good a set of cameras. Unless you really want a 7-inch tablet instead of an 8-inch one, the larger version is worth the extra money. I have received a number of emails from Techlicious over the past week or so and noticed that someone is fixing your transmissions so that a POPOVER covers most of the screen. I am not sure what you call the darn things, but you can’t seem to get rid of them, which, results in my simply deleting your email. I don’t know if that is intentional on your part or what, but it doesn’t look like it. Maybe it’s even my browser, but I though the least I can do is let you know about it. Sorry if I am wrong, but I thought I would let you decide that. I intend to use a tablet as the audio source for my decent quality audio system. Can you tell me if in your experience all audio output from different brands of current tablets are roughly the same quality? For example, compared to this Nvidia which currently sells for $199, would there be a noticeable difference in the quality of audio output (not from the speakers but through the line output) compared to a $115 Kindle Fire HD8 or a $280 Samsung Galaxy Tab 4?